So you're in the market for a termite spray, but you're not quite sure what you're looking for? We've got you covered. Our top suggestion goes to Bifen I/T Insecticide Spray. Essentially, it's everything you're looking for in a termite killer: it's efficient, it's safe, it's well-known, and it's affordable. Normally, you've got to sacrifice one or two of these qualities when you're looking for termite control products, but Bifen I/T does a nice job of delivering a quality product at an affordable price point. We talk more about some things to keep in mind when eradicating termites from your property, as well as some tips you'll want to know for the future to preserve your property. Keep reading below to learn more! Why Use a Spray in the First Place? Are These Indoor Termite Sprays? What Should I Keep In Mind When Shopping For Sprays? The internet is chock full of misinformation about how to get rid of termites in soil, how to get rid of termites in walls, and whether there's a natural termite killer recipe out there. If these are the types of questions you have, look no further. We've got them all right here, plus even more. Let's jump right into the in-depth guide! If you're in a hurry, you can click the links below for a quick look at the top five termite sprays we reviewed. For a more a comprehensive explanation (plus tons more information about in-home termite control), keep reading below. Though it may seem like these little guys are immortal, they do have their Achilles heel. But among all the names of chemicals floating around, which are the best termite killer products out there? Generally speaking, insecticides which kill termites specifically can be funneled into a class of their own called a termiticide. This is a blanket term covering the vast majority of chemicals which work to eradicate termites from an area--whether they live in soil or they've taken up residence in the woodwork of your home. In addition to termiticides, a chemical called an insect growth regulator (or IGR, for short) is present in most all insecticides and gets the job done as well by stunting the growth hormones of the insect in the larval stage of life. When you use a spray for termite control, you are buying a concentrated version of the termiticide that is mixed with water and sprayed into an area to then reach the termite colony, killing its members. With all the options available for taking out termites, what makes a spray the best bet? the sprays offer residual protection against new infestations long after the termites (or other pests) in question have been eradicated. Can't I Just Use Vinegar to Get Rid of Termites? In the world of pest control, vinegar is almost like liquid gold. And yet, when it comes to termites, this is where vinegar's powers fall flat—you’ll need something a little stronger to take out these ravenous insects. In fact, termites actually produce a crude form of vinegar in their gut microbes. As their stomachs break down the wood and metabolize the cellulose within for nourishment, termites create acetic acid molecules (better known as vinegar), which they then use for energy. So, essentially, if you douse your woodwork in vinegar in an effort to drive the termites out, you're probably just fighting fire with fire. If you've got termites on your property and want to get rid of them yourself, that's understandable. However, we recommend to go the DIY route only when you've got termites in your soil or in trees or bushes in your yard rather than infesting the wooden structures of your actual home. Well, once termites invade your home, you're outnumbered. Even if you have a full house, the termites will still have you beat--even the smallest termite colonies fall in the 50,000 member range! Once they're in, they're really in--setting to work chomping down on your hard-earned property. In the soil, it's relatively simple to spray a chemical to eradicate the termites, but the properties of wood make it so that it the chemicals dry out and distribute without as much ease. If you spot these safety tubes or notice drywood termite bite marks in your woodwork, it may be too late for home remedies to get rid of your termite problems. Take our word for it--with a destructive pest like termites, biting the bullet and shelling out for a high-quality product or termite control service will pay for itself in the long run. One of the most common questions on consumers' minds is whether most termite control sprays can be used both indoors and outdoors. We get it: you want something that's strong enough to combat the elements outside, but gentle enough not to affect your pets and kids indoors. The good news is that most sprays sold to consumers in a retail setting (both online and in stores) are versatile in the sense that they can be flipped for whatever you need; either indoor protection against termites or an outdoor safeguard as well. Keep this in mind: just because all sprays are marketed to kill termites means they're the same. Here are a few things to consider when you're making your selection. Do you have other pests in your yard that you need to kill as well? Are there any standing bodies of water on your property? Do you grow any of your own food in the yard? If so, will you be spraying these crops? Most termite killer sprays are sold as industrial bottles and require a spray nozzle to administer the liquid in your yard or home. The spray nozzle spreads the liquid evenly throughout an area, and it allows the chemical to seep down into the soil to further distribute with existing moisture from rainwater. A huge bonus of the spray nozzles is their utility: not only can this sprayer be used to distribute termiticide through your home or garden, but can be thoroughly cleaned out and used to spray fertilizer or herbicide as well. We recommend something like this. If you're single, or maybe a household of two adults, this section may be a simple shrug of the shoulders to you. But if you've got a baby learning to crawl in one room, a toddler tinkering around in another, a dog chasing his tail in the front yard and a cat snoozing in the corner, you may be wary about firing off a chemical through your home, no matter how non-toxic it claims to be. It's important to learn about some of the major termiticides and insecticides so that you can make a decision as an informed consumer, rather than just grabbing something from a shelf or an Amazon lineup. Will These Insecticides Hurt Me? It's natural to wonder whether your nerve endings will also meet their untimely demise if you use a termite spray with one of these ingredients, but don't fret! These sprays work their magic on termites because their bodies are so small. A human would have to gulp down more than their fair share of termiticide to have any ill effects. That being said, please exercise caution if you do have young children in the house. Always use your best judgment and keep chemicals out of reach of kids. If any chemical is ingested, please contact Poison Control immediately. Also, make sure to use proper Personal Protective Equipment (PPE) while spraying your yard and garden for termites. To get an idea of what we're talking about, check out the information in the video below. Bifen I/T is a simply effective spray which targets termites before they burrow their way into your wood structures, which is why it's out top pick. This spray contains the active ingredient bifenthrin at 7.9%, which is high enough to knock out termites fast, but gentle enough to use in yards where pets and kids run around and play. We rated this spray higher than Permethrin not only because it's easier on the wallet (though that was a main factor), but because of its staying power. The next contender on the list, Permethrin SFR, definitely works well to take out termites in the ground, but dissipates in sunlight after about 14 days and must be reapplied. Bifen I/T can last double that time, with a residual protection time of about a month. 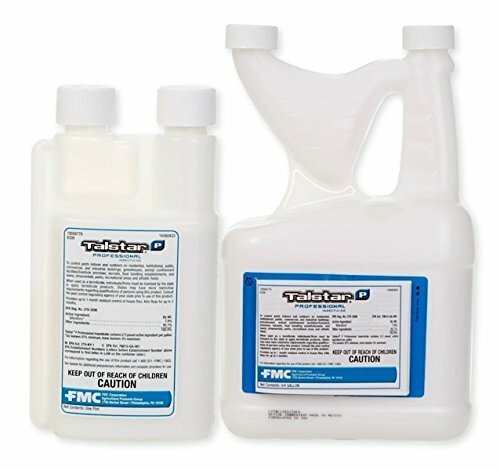 When you mix the solution with water to create the spray, you can decide how potent you'd like your chemical termite killer to be. If you're working outside, you have some wiggle room to make it a little stronger. If you are spraying in the home, you might want to dilute it pretty heavily and air out your home for a few hours afterward with doors and windows open. Bifen I/T does require an external nozzle to spray the liquid, which is sold separately. 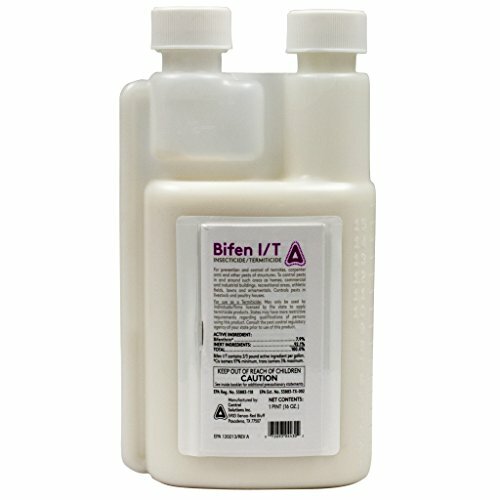 We recommend Bifen I/T to anyone who is looking for a quick, sensible, and effective solution to their termite solution before it gets out of hand. Because Permethrin comes from the chrysanthemum flower, it's an ideal choice for consumers with pets and kids who are looking for a gentle solution to an aggressive problem. This product contains 36.8% of the active ingredient--a surefire way to knock out the termites gnawing their way through your yard. In addition, Permethrin SFR has been shown to eradicate other pests like fleas, ticks, bed bugs, mites, ants, mosquitoes, gnats, deer flies, and roaches. Because of the high permethrin content, there are mixed reviews on whether or not this product can actually be used inside the home--which is why we placed it in the last ranking on our list. 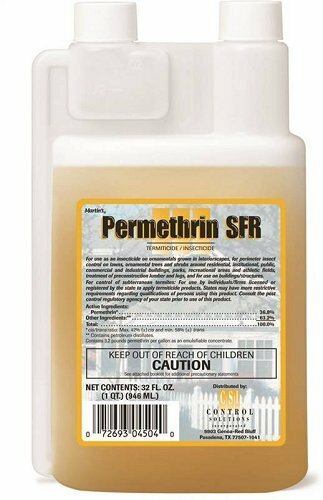 Permethrin SFR is marketed as an indoor and an outdoor product, but some sellers on Amazon recommend to only use it outdoors. Normally, the first name to come up at the mention of termiticides is Talstar. It's the most widely-acclaimed, well-known termite spray out there, and for good reason. It certainly gets the job done, killing termites as well as other insects that get in the way. It's convenient, requiring only an extra spray nozzle to administer the liquid out into the yard. It contains a high level of Bifenthrin, but not so high that it can't be used inside. So, why don't we list this as our top pick? Simply put: it's too expensive. You're paying for the brand, but you really don't have to. We can't deny that it's a wonderful product that has its merits, but the same product can be purchased for a lower cost. If you're working with a tight billfold, this is the product for you. 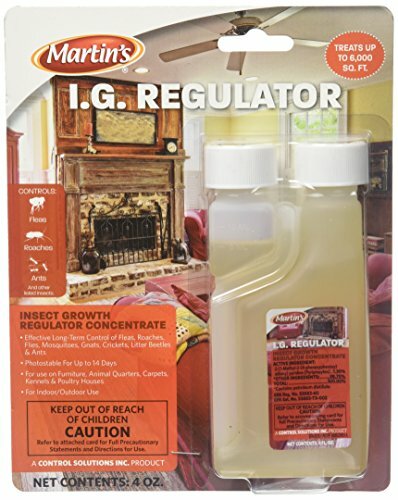 Not only is Martin's IGR Concentrate the economical option when you're doing your initial shopping, but it begins to pay for itself: IGR stands for Insect Growth Regulator. This means that instead of killing just termites, it stops all insects in their tracks...literally. Pests' growth hormones are inhibited in the larval stage, meaning that new bugs can't pop up and, well, bug you. This spray is suited for mostly indoor use--which we really like--because you can protect your home from a potential termite infestation before it happens. While you're at it, you can kill off any other bugs that may be lurking around, whether you know you have them...or not. 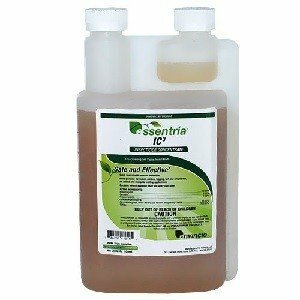 Essentria IC3 Pro Insect Killer is an awesome alternative to those who want an all-natural and botanical answer to their termite problem. The solution is compliant to EPA standards as a botanical insecticide, and passes the EPA's Federal Insecticide, Fungicide, and Rodenticide Act (FIFRA) Section 25(b) exemptions. In addition, Essentria IC3 Pro Insect Killer complies with the standards of the National Organics Program. We recommend this product not only for consumers who want to take a more natural approach to knocking out termites in the garden, but for those who have standing water. If you have a pond, a pool, or access to a creek anywhere on your property, it's imperative that you use a product that's not quite as harsh, chemically speaking. The last thing you want is for a ton of chemicals to build up and grow stagnant in your pond while termites run free, escaping into your home. Of all the termite killer sprays we reviewed, Bifen I/T combines value and quality seamlessly in one package. It's easy to find in stores and online, it's simple to mix at home, and the process of spraying your yard is straightforward. Though the spray nozzle is an extra cost, it's good to think of this as an investment. After all, this is a versatile tool in the garden; it can be used to spray herbicides and fertilizer for years to come! Curious about other termite-related products? Check out our other detailed guides to help you deal with your pest problems.